Every thirteen years they emerge from underground where they have been feeding on roots. They crawl up tree trunks or fence posts and then draw themselves out of their nymphal skins. 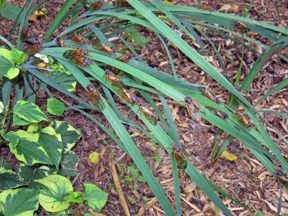 They fly a week, the male cicadas sing to attract females, they mate, the females insert their ovipositors into tree branches and deposit eggs, then the five-week-old bugs die. The nymphs drop to the ground and bury themselves for thirteen years, and then the next generation climbs to the light to do it all over again. What kind of a life is that? What’s their purpose, other than providing a steady month-long diet for raccoons, skunks, and possums every thirteen years. Needing to ground myself, I took the dog to the northern edge of my neighborhood where a tributary of the Harpeth River runs and stepped out onto a wet rock in the water. She sprawled in the cold flow. She’d gone with me on walks, helped me raise two boys, supported me through a divorce. I sat on the stone and let the river move on without me and let its whooshing sound block out the pain of the real world. There at the river, vines crept and crawled, and exposed tree roots twisted across the banks, as time had washed away their mooring. Leaves from seasons before covered the sides of the creek, as did clumps of coreopsis, patches of clover, and wild roses. Cicadas screamed their primal sounds. All the while the river rushed onward, gushing around slabs of jagged rocks, hell-bent west toward sunset. Life is like that, too, and so there at the river, I thought about death and how the present is such a brief moment and the future is forever beyond the curtain of that final sunset. My world would change when sunset came, and I feared the emptiness without her. I was afraid of death. There at the river, I asked questions, sought answers. How do I let her go? How do I say good-bye to someone I love? How can I accept the finality of death, save crying with clenched fists and crusted heart at the fiery embers of sunset or recoiling in a fetal ball and closing my eyes to sunrises beyond? And I knew the whole time I was grieving for her, I was really grieving for my father. His five heart bypasses were twelve years old and he was having other health issues and I knew I was going to lose him. I’d never lost anyone close to me, and I didn’t know what I’d do without him. I couldn’t imagine life going on, the sun ever coming up again. My retriever died six months after that cicada event. Now they are back. I step out my door and one swoops down against my neck. Their exoskeletons are clinging to the decking and the arbor, and I step around them as I cross the patio. They are stuck to the ivy, azaleas, and thyme. I can’t let my cocker spaniel, born six months after the last swarm, outside because she eats them—all the transparent shells that have encased the red-bulging-eyed bugs for thirteen years. Apparently, they taste like popcorn. Only they are not digestible. I am a prisoner to the bugs—forced to hear the swell and ebb and flow of their mating cries and forced to keep the doggy-door closed, not giving my dog access to the yard, which means I can’t go anywhere for a long period of time. Six years after the last cicadas, my father died. I had already grieved him because I grieved for the retriever. Yet I still felt the loss and it weighed heavy on me and then two years after I buried my father, my husband died and this was uncharted territory because I’d never lost anyone my life depended on, one I was with every single day, and I didn’t have enough time to forge through this grief before my mother died and I went to a deep abyss where there was no light and I was closed in and cocooned and separated from what life here on earth is supposed to be. If I could just scream and call them all back, I would. So now the cicadas are back and all I can think about is that the last time they were here, so was everybody else, and I wonder if they were heralding death, and now once again their dizzying screams fill up my head.